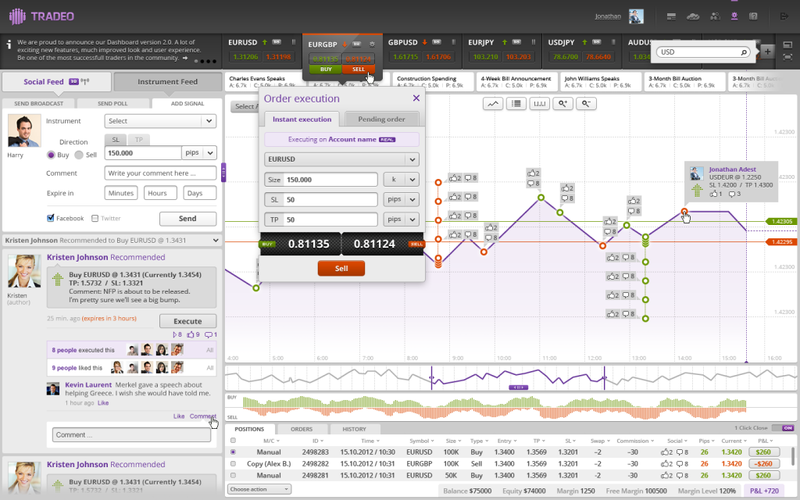 Social trading network Trade has announced the launch of SocialTrader. The product combines the network’s ‘Cloud Trader’ web trading platform and social network on one interface. The goal of the new product is to allow users the ability to have access to the network’s social sentiment information directly from Tradeo’s order entry interface. Moving away from just providing social trading access to MT4 brokers, the company also announced connectivity to the ACT platform. Within the Social Trading industry we have seen the launch of cross broker products become more developed during 2012 as they compete with the massive user network of eToro. Overall, a social trading platform’s success is limited to the breadth of its users. Also, while a trader searching for social trading is most likely to go to a pure play like eToro, it will be interesting to see ahead how individual brokers begin to market their cross broker social offerings. Currently, most brokers simply market the product alongside their existing offerings. Meaning that a user needs to be first interested in searching for a broker while then deciding to use the social trading platform. Therefore, to fully compete with eToro, a broker may need to devote a dedicated marketing campaign and separate web pages just to its social trading product. Tradeo, the financial world’s foremost pioneer in Social Trading, announces its new SocialTrader platform. Tel Aviv / London / New York – 26 December 2012 – Tradeo is pleased to announce SocialTrader, a fully-realized web-trading platform featuring an entirely integrated social network. Until now, any trading site’s social features have existed solely in parallel with trading. With the advent of Tradeo’s SocialTrader, trading and social functionalities are, for the very first time, combined on a single screen. The revolutionary SocialTrader application has been created utilizing some of the online world’s most advanced technologies, including: HTML5, WebSockets, and liquid layouts. These sophisticated underpinnings enable Tradeo to reliably deliver this complex product in a fast, secure, and elegant fashion. 1. Personalized, real-time price streaming based on each individual user’s trading account. 2. Full trading capabilities including one-click close for multiple positions. 3. Support of both MT4 (via plugin) and Act (via API). 4. Real-time Social Charting consisting of a visual layer of social trading data (the positions and orders of other users). • By hovering over positions to view additional information, one can readily visualize the social trading trend. • Collaborating on a trade is as easy as clicking on the position. • One’s own positions are also clearly indicated. • Trade execution can be accomplished directly from the chart. 5. Social Feed incorporates the broadcasts, polls, and signals of other traders. The entire Tradeo network continues to live right beside SocialTrader and its exciting, new features. Users can still filter, meet, and collaborate on Tradeo in exactly the ways they’ve grown to love, including auto-following of other users via the ‘Copy Trader’ system.